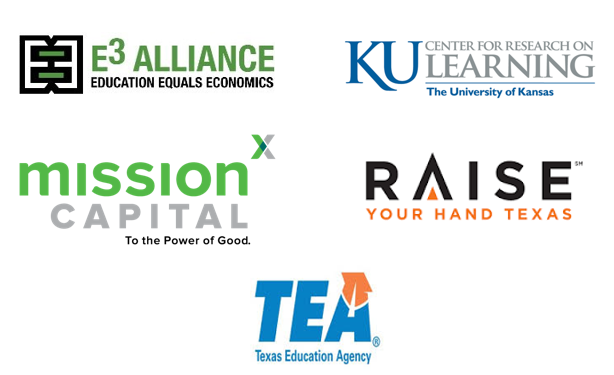 E3 Alliance – is a regional, data-driven education collaborative based in Austin, Texas building the strongest educational pipeline in the country to drive economic prosperity. E3 Alliance is a nationally recognized leader in collective impact in education, and acts as project manager, client and partner coordinator, implementation lead, and fiscal agent for RAISEup Texas. Mission Capital – a team of Social Venture Partner volunteers, led by Andy Roddick Foundation CEO Richard Tagle, have helped to craft the Business Plan for RAISEup Texas expansion and have committed to help execute the goals of the Expansion Plan as part of the first Mission Capital for Nonprofit Success Accelerator program. RAISEup Texas expansion was one of three ventures chosen for this support out of over 100 applications submitted and vetted throughout the spring and summer of 2014. Raise Your Hand Texas – trains public school leaders to lead transformational change at the campus level and advocates for public policies that make public schools better for all Texas students. RYHT works with the International Center for Leadership in Education (ICLE) to provide year-long training and nationally-recognized mentoring in leading transformational change. This training will be provided to every vetted and approved RAISEup Texas principal leader free to the participating school. Texas Education Agency – is the state agency that oversees primary and secondary public education. It is headed by the commissioner of education. The mission of TEA is to provide leadership, guidance and resources to help schools meet the educational needs of all students. The University of Kansas Center for Research on Learning – KU-CRL are the researchers behind and creators of the Strategic Instruction Model™ (SIM), a research-validated program that helps adolescents learn how to learn, providing a means for them to achieve independence and success. KU-CRL works actively with RAISEup Texas to ensure that the most recent research findings can be deployed and that lessons learned from across the national SIM network can be leveraged in our schools.